Swiss Re Next is the name of the new open space offices of the Zurich-based insurance company. Diener & Diener’s Swiss Re Next building, with its undulating glass continuous façade, was built on the site of the company’s old headquarters, constructed in the ’60s by architect Werner Stücheli, now demolished. Christ & Gantenbein were involved in the renovation and expansion of the Landesmuseum, the Swiss national museum in Zurich. 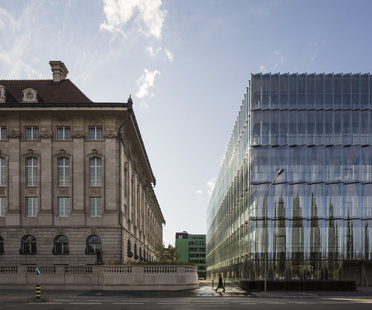 Christ & Gantenbein’s new body arises out of the older historicist museum, completing the idea of an island of culture in the heart of Zurich. Duplex Architekten’s social housing project has won the sixth biennial prize awarded by the Order of Architects of Milan. Special mentions were awarded to C.F. 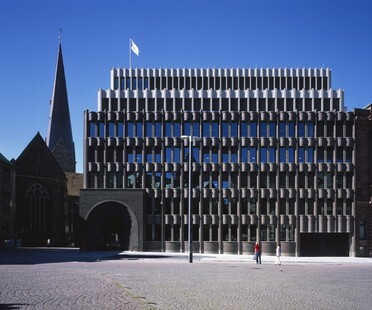 Møller Architects, Muller Sigrist Architekten and Froetscher Lichtenwagner. Swiss firm Boltshauer Architekten has designed a 12-storey residential tower in the Hirzenbach district of Zurich, which combines its connection with the modernist context with the flexible concepts of the actual apartments. An experimental format for collaborative design and construction by the École Polytechnique Fédérale de Lausanne ended with the realisation of an architectural installation in Zurich. Architecture designed by the huggenbergerfries studio in Zurich is on show at the Architektur Galerie Berlin from 6th July. The exhibition highlights its relationship with its setting. Bags made from recycled truck tarps that have travelled Europe-wide. Architektur Galerie Berlin dedicates an exhibition to Caruso St John, the studio of architects Adam Caruso and Peter St John, winners of the RIBA Stirling Prize 2016 with their design for the Newport Street Gallery in London.